Maco PKG designs and manufactures custom printed poly bags and valve bags for many applications and a wide variety of markets, including commercial, military, and specialty industries. Depending on your specifications, we can manufacture your package with unique leak proof specification, custom printing up to 6 colors, valve fittings, or other specialty-converting processes. What kind of poly bags or valve bags do you need? Many of our clients think they know what type of bag they’re looking for; however, our clients are pleasantly surprised when they find that we offer many options, including poly bags, valve bags, electrostatic discharge (ESD) bags, barrier bags, foil bags, and custom printed bags. Take a look at some of our popular bag options! Our printed poly bags are used for everything from sporting goods to medical equipment. They come in various colors, sizes, and densities. 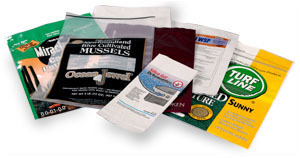 Our 5-sided, 3-dimensional bags are used for a wide variety of markets. Special applications include container liners and equipment covers used to protect products during shipment. Not only can we customize the bag itself, but the printing as well. 3D poly bags can display custom printing when shelving because they can stand up on their own. We can customize your printed poly bags based on your specifications, target end-users, industry, and market. Since packaging is such an important factor in brand recognition, fully customizing your poly bags is one of the most effective ways to market your product and differentiate it from other products in the same industry. A valve bag is designed to meet your high-speed filling needs. A valve on the spout packer (air packer, grooved belt packer, gravity packer, screw packer, or impeller packer) allows for more efficient filling performance. If you need additional moisture protection, our valve bag products can be equipped with PE-Inliners or PE-free film as needed. Our custom-made barrier bags offer superior protection from grease, gases, light, moisture, chemicals, and liquids. They’re frequently used in the food industry due to their exceptional protective capabilities. One of our largest packaging products, military shrouds are used for tanks to protect objects from contamination. Retain your product’s distinct shape with our contour shape bags and shrouds. They can be designed and cut to meet any unique shape. When you need double the resistance and protection against punctures, you need double wall bags. They’re recommended for photographers because they prevent UV rays from damaging light-sensitive photographic products inside. Looking for a low-cost option to fill bags? Wicketed bags are most often used for food packaging. Choose from a variety of options including bottom gussets, tear starts, flat bottoms, and more. Looking for safe ways to package your liquid products? Eliminate messy recalls with our leak proof seals. If you need to package delicate electronic parts, our ESD bags can shield your sensitive contents from static electricity. They provide excellent protection for populated boards and are highly reliable. Valve fitment bags are ideal for many different products and may increase the value of your product. They also minimize waste at time of use. Inline die-shape sealing ensures the seals on the seams on your poly bags and valve bags are clean and free from artifacts. Accurate, precise edges help you avoid contamination problems during the packaging process. Poly bag tape closure is a quick, affordable way to make sure your product stays safely enclosed in the bag during assembly, storage, shipping, and unpacking. Heavy gage side seals are ideal for banding or strapping large/heavy items, non-edibles, and food products in preparation for shipping or general bundling. Professionally-designed poly bags paired with the right closure option help you effectively market your product, so are you ready to start customizing and manufacturing your poly bags and valve bags?